Folding shovels have become increasingly popular as of late for a few simple reasons: they are loaded with tools, easy to carry, and affordable. These tools often have a variety of features, so it can be hard to narrow down which one will work best for you. Some include pickaxes, others have fire starters, and some have features like a whistle or a serrated knife blade. We\’ve taken all the best options, analyzed them, and broken them down so you can see which is the best folding shovel for your specific needs. Let\’s get started with our top overall pick! Harvet\’s portable shovel is one that includes a lot of features and is best suited to those who want to use a folding shovel for a lot of different tasks. This shovel has 3 different height settings: 15\”, 22\”, and 28\”. The handle itself is extendable and the shovel head can be turned 45 degrees, 90 degrees, or 180 degrees. The shovel can also be taken apart so that it fits into the included bag, so you won\’t have any worries about portability with this one. The Harvet includes additional features like a hammer, saw, knife, and screwdriver. Since the shovel head can be turned at an angle, this shovel can also function as a makeshift pick for the times you need to dig at a strange angle. This shovel does several different things well, but it doesn\’t do too many things. If your goal is quantity of additional tools, keep reading. The product description for this tool mentions a money-back guarantee, but we weren\’t able to find more information about that guarantee\’s length or what it covered on either Amazon or the manufacturer\’s website. The Harvet shovel is a great pick if you\’re looking to buy your first folding shovel, if you don\’t have a single intended feature for your shovel, or if you want a good overall pick. Rhino USA\’s shovel is a good pick if you\’re looking for a tool that can double as your best garden assistant. This shovel is 23\” long when extended but only 9\” x 6\” when collapsed. This shovel weighs 2 pounds and comes with a carrying case. It doesn\’t need to be broken down or separated into multiple parts, so the Rhino USA is easy to transport. This shovel doesn\’t come with a lot of different features like many others on this list, but it is more of a specialized tool. This shovel includes a pick and will allow you to turn the shovel head at a 90-degree angle to the shaft, forming a sort of mattock for gardening. The pick added to this shovel is a pretty unique feature and it\’s the reason that this is our recommendation if you\’re looking to do some work in the yard. This shovel also happens to be a great budget purchase if you aren\’t looking for any of the bells and whistles that other items offer. A lifetime warranty is included. All in all, this is the shovel we recommend if your goal is to do a little yard work or you\’re looking to buy the most budget-conscious option. The Tabor Tools shovel eliminates all the excess and gives just a folding shovel, but it is a folding shovel that can be moved around, bought on a budget, and still perform better than some competitors. The Tabor Tools measures out at only 19\” when at full extension and weighs 1.3 pounds. This is the shovel for maximum portability. You can toss this shovel in small places, put it in the back of a closet, store it in your car, or probably even carry it around in a larger-than-normal pocket without looking like a psycho. What this shovel gains in portability, it loses in features. There is a serrated edge to one side of the shovel head, but anyone who has ever tried to saw through wood with a shovel head knows that you may be spending your afternoon cutting through a piece of wood that identifies as a twig. You can feel free to cancel the gym membership, as your newfound saw will take care of all your physical exercise needs. No other tools are included with this shovel and there is no warranty on it. That said, this is a very budget-loving buy. The Tabor Tools shovel is the best pick if you\’re looking for something to carry around without any trouble or want a shovel that is very lightweight. The Iunio folding shovel comes with so many features that MacGyver himself couldn\’t think of anything else to do with it. This shovel has adjustable heights from 17\” inches to 35\” and weighs about 3.5 pounds when at max extension, so it is by far the longest, largest, and least portable shovel on this list – but, no worries, it still breaks down into separate parts that fit into a single bag. This shovel\’s size does make it the most similar to an actual shovel that is just used for digging, so this is also a good pick if you are looking to do heavy duty digging. The Iunio shovel comes with a ton of tools: a hexagonal wrench, saw (included in the shovel head and in a separate knife), bottle opener, nail extractor, hoe, fish scaler tool, a whistle, fire starter, a pick, and a knife. This doesn\’t include the bar extensions themselves which allow you to extend from 17\” to 35\”. The head on this tool can extend to several different angles if you want to use the tool as a mattock or are digging from a weird position. This shovel comes loaded down with extra tools, but no warranty is included. It will also set you back a few dollars more than other options on this list. This is the best pick if you\’re looking to get a lot of tools in one or if you know that you\’re going to be doing some heavy duty digging. Since this shovel can be extended to a full 3 feet, it\’s a good pick to give you some leverage with the ground. If you\’re looking to get the most bang for your buck, we recommend the Dohiker folding shovel. This shovel measures out to 3 adjustable heights of 13\”, 19\”, or 25\”. The head can be adjusted to 45, 90, or 180 degrees and a pick is included, so you can make a mattock type tool with this shovel, as well. This shovel weighs in at 2 pounds and separates into different parts to fit into a bag. The tools included in these separate pieces are numerous: a fire starter, a knife, a saw, whistle, bottle opener, ruler, wrench, and more. There aren\’t as many tools here as in some other options (read: All the Bells and Whistles), but this is the option with most tools for the price. It\’s worth noting that this folding shovel doesn\’t have the most tools out of all our options, nor is it the least expensive of the options we\’ve reviewed. We are calling it our top budget buy because it does have the most included tools for the price. It satisfies a lot of needs while still being one of the more affordable options. Dohiker is also nice enough to include a 2-month money-back guarantee and a 1-year warranty if your tool breaks. This is the tool we recommend if you\’re looking to get as many features and tools as possible while spending as little money as possible. It\’s a good option for those who want the max bang for their buck. As you can tell, many folding shovels come with a whole bunch of different tools attached. With some shovels, it\’s something simple like a serrated blade to cut through small pieces of wood. With other shovels, it\’s a full 16-piece set that seems like it should be enough to last you through an apocalypse. Well, maybe, but maybe not. It\’s worth taking a moment to consider what you\’re really looking for. Do you just want something small and portable that you can dig a few holes with? If so, it won\’t hurt you to take a serious look at one of the options without so much stuff. Or maybe you want something you can throw in a \”go bag\” that can have a huge number of uses while saving you on space and weight – one of the more Bells and Whistles options will go a long way towards serving that need. When it comes down to it, it will be up to you to determine if you want one of the fancier all-in-one options or something a bit more simple. We encourage you to take a moment, think about your objective, and don\’t be afraid to use your shovel just for digging. Most of the shovels we\’ve listed above seem like they would be put to shame by a \”real\” shovel; it seems like most of these couldn\’t hold a candle to a legitimate, 5 feet tall, thick metal-headed shovel. Despite the small size of most of the options on our list, the majority have no problem going toe to toe with their bigger cousins when it comes to staying power. The shovels on this list were built to last. All of the shovels we\’ve reviewed are made with either high-grade carbon steel or high-grade stainless steel. These metals should help your folding shovel to stay rust-free and durable while under pressure. Neither type of metal is necessarily stronger than the other, but both will ensure that your shovel has a long life span. The weakest part of any of the shovels we\’ve reviewed would no doubt be the grip since it is made of rubber. At worst, with heavy use, you might expect your handle to begin showing some wear over time. If you are worried about the durability of your product, take an extra look at the products with money-back guarantees or warranties. The Rhino USA folding shovel comes with a lifetime warranty, meaning that if you break it at any point in your life, the company will replace it for you. For most users and under the majority of situations, each folding shovel should last a long time. Is storage for the shovels included? Yes. All the shovels we\’ve reviewed come with a pouch that you can place the folded up or broken down shovel in. How do I fold, break down, or open my shovel? Whether your shovel folds to its minimum size or can be assembled in different parts, the process is the same: you will need to loosen or tighten a hand screw (you won\’t need anything other than your hands to do this) and then maneuver the shovel how you like it. If your shovel breaks down into many separate parts, each part will have some sort of locking mechanism. Often it is some form of a hand screw. What is the size of the bags and what is the total item weight? Most bags of all the shovels on our list measure in at about 7-9\” x 6\”. The heaviest shovel is 3.5 pounds, but the lightest shovel weighs just 1.3 pounds. What type and quality is the steel in these shovels? These shovels all use either stainless steel or carbon steel. Whether carbon steel or stainless steel is stronger depends on the grade of each, but rest assured that all of the shovels on our list are built to last. Rhino USA is a small business owned by a father and his two sons. The Rhino USA team is committed to helping you blaze your own trail and help you adventure where you want and when you want. They back all their products with personalized customer service and a lifetime guarantee. Tabor Tools was founded in 1982 and with over decades of experience behind them, now wants to provide people with tools that can work as hard as you do. Their goal is to provide you with high-quality, durable tools that can help you to get your yard just how you like it. Iunio was named after the Latin word that means \”youth\”. Iunio named their company to signify an experience of total well-being, of a life well lived. Iunio is passionate about providing high-quality products to the people who want to live their best life. With this company, quality is the most important thing. Dohiker was founded in just 2016, but since then has built a whole assortment of products designed to help you build the yard of your dreams. Sporting a huge number of employees in the research and development department, Dohiker wants to make sure that you get more stuff for fewer dollar bills. 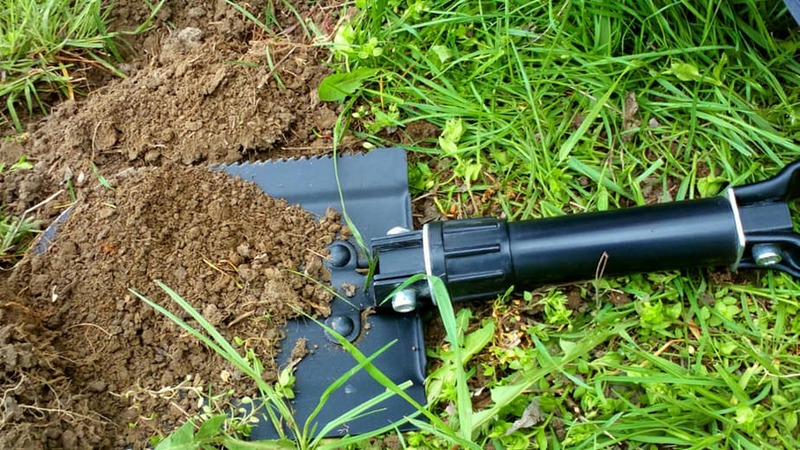 Thanks for reading our guide on the best folding shovel! When it comes down to it, the best option for you is going to be the one that suits your unique needs best. It\’s worth asking yourself what you want to use your shovel for. Are you just looking to dig a few holes? Or are you looking for more of an all-in-one solution that could save you some money compared to buying various tools separately? It\’s also worth considering what kind of holes you want to dig with your shovel. The longer the maximum length of the shovel, the easier it will be to use standing on your feet, allowing you to get full leverage. If your shovel lets you adjust the length, you will be able to use it for tasks like digging small holes in the sand or in your garden, but also for digging post holes ( but only if you really have to. We recommend post hole diggers for that). Our overall top pick is the Harvet Portable Shovel. It includes several tools, is packed with features, and won\’t do too much damage to your wallet. If you\’re looking for a feature-packed option, we recommend that you go with the Iunio. For the best budget buy, we recommend the Dohiker. When all is said and done, the best folding shovel for your needs will be the one that can solve your needs, provide the features that you like, and come in at the price range you\’re looking for.